I'll be giving a talk at the O'Reilly Tools of Change for Publishing conference in New York City next week: Beyond Numbers: Gatekeeper Effects and Just-in-Time Publishing, on Tuesday, February 12th, at 2pm; conference details here. The talk is on the commercial potential of on-demand publishing of freely-licensed material, even as a storefront business model, and how it could mean a richer and more participatory experience for readers, authors, and booksellers. A US court has found that copyright law can cover "cease-and-desist letters", that is, letters sent by copyright holders telling someone to stop distributing copyrighted content. Cease-and-desist letters are frequently used as tools of censorship (as Chilling Effects has ably documented). A common scenario is that someone gets upset at having something of theirs quoted, and is able to shut down the quotation by claiming copyright over its text and then sending C&D letters to anyone who displays it. The quoted text is not royalty-generating for the copyright holder (not that it would excuse censorship even if it were); rather, the sender of the C&D is simply using copyright law as a tool to prevent the publication of potentially embarrassing information — that is, to censor. 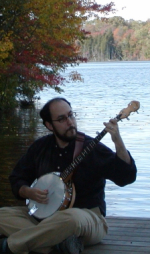 I frequent exciting websites like www.banjohangout.org, where banjoists from all over the world (all 12 of us!) talk about banjos, songs we like, how to play things, and so on.